Privacy screens are used for more than just, well, privacy. 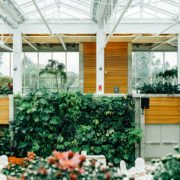 Whether you need to block unsightly views with a green wall, grow your brand with a branded living wall, delineate space, or showcase your property with a vertical garden, green walls can provide just what the doctor ordered when it comes to solving any of these challenges. 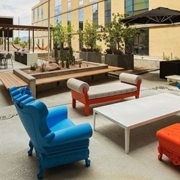 Adding a patio privacy screen to block visibility of a pool down below from the cafe terrace above is one such practice that has been successfully used by Marriott Irvine, for example. 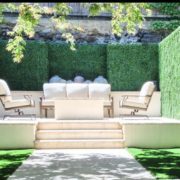 Another customer had Artificial Plants Unlimited design a snug lounging area by creating a casual wall garden surrounding their outdoor seating. Still another common use of green walls is as balcony privacy screens blocking lateral or lower viewer’s line of vision. The latest phenomenon of incorporating a corporate logo into green walls adds a certain creative panache to an otherwise plain concrete wall. Many companies are moving to creating unique bespoke type shapes to mount on walls, furthering their unique decorative distinction. Creating a 3-dimensional living wall shape definitely sets your decor apart from the rest of the corporate pack. 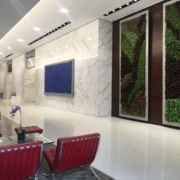 Whether you choose a flat, flush-to-the-wall living garden that incorporates your logo or a 3-D shape that showcases a company symbol, rest assured, creating a vertical garden that portrays meaning and beauty adds innovation and style to any wall. Many outdoor cafes have chosen to integrate a patio or deck privacy screen that serves a partitioning function. 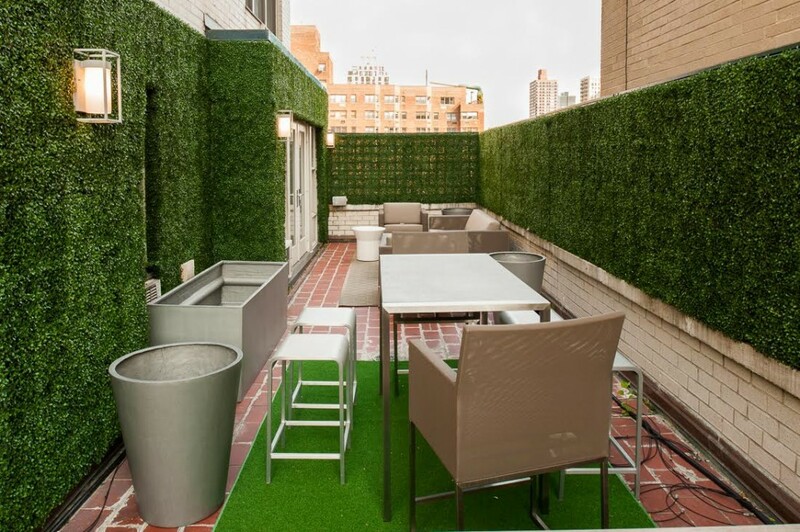 These veritable free-standing privacy screens are typically 4-sided and completely covered with artificial boxwood foliage that mimics walls or half walls. They let you cordon off portions of an outdoor seating area, serve as pedestrian barriers, or create “rooms” where none existed for special events. They’re not only beautiful, they provide a very practical function that allows you to manage both space and “enclose” groups of people comfortably. Easy to put up and take down, their portability is also a huge time as well as expense saver for many businesses. 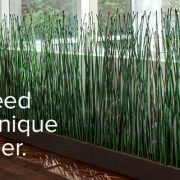 Artificial Bamboo can also be effectively used as a privacy screen, either indoors or out. Choose between thickly “planted” groves or those that allow some light to filter through. Both are equally stunning in their own right, depending on preference and use. 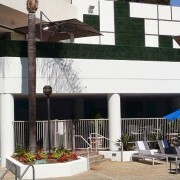 Green wall materials available include UV protected faux foliage in the following areas: English Ivy, several varieties of Japanese Boxwood, Azalea, Podocarpus, Baby’s Breath, Replica, Succulent Cactus, Grasses, as well as custom creations. All are mounted on durable powder coated grids or cages. 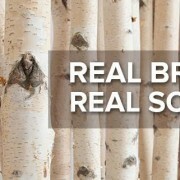 To learn more about how your company or home can enjoy this eco-responsible solution that enhances your space in the process, Click Here to check out our user-friendly Buying Guide or call 888.320.0626. Superb blog about privacy screen. Privacy screen is looking really beautiful. This is good idea to enhance outdoor or indoor. I love this shade of green. I appreciate the information on privacy screens. I agree that there are many uses for privacy screens and they can be very helpful in blocking many things aside from the view. My mo has been having issues with bugs in her backyard and has been wondering about privacy screens for that reason, I will be sure to share this information with her.